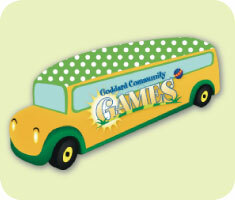 The Goddard Community Games Virtual Tour Bus is Back! Commitment to our community is at the heart of The Goddard School. To unite our Goddard School community with our online community, we are bringing the Goddard Community Games Virtual Tour to you…with a new twist! The Goddard Community Games Virtual Tour acts as a launch to our nationwide Goddard Community Games event (taking place on Saturday, February 11, 2012). Last year, all families were invited to join us on our exciting tour by sharing their favorite family-friendly activities and places to visit in their community (e.g., the best family-friendly restaurant, top no-cost activities and favorite educational landmarks). This year, there is a new spin to the Goddard Community Games Virtual Tour. We are taking several of our families’ favorite places to visit in their community from 2011 and creating a ‘scavenger hunt’ for 2012! When Facebook community members guess the correct locations that ‘Gus the Bus’ wants to visit, he will receive a bumper sticker before leaving the state. Help Gus the Bus visit all of our family-approved locations in your community. Let the Goddard Community Games begin! Visit us on Facebook today! Over the last two decades, children have lost eight hours of unstructured playtime in their week. Since 2002, 34% of kindergartens have eliminated recess. This trend of cutting back on playtime may have more negative effects than most parents are aware of. Although the debate on whether rigorous academic learning or play-based learning is more effective rages on, recent studies have shown playful learning has many positive, lasting effects unmatched by academic-based learning. 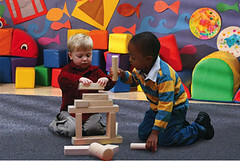 “When compared to academically-based preschool programs, children in play-based programs outperform the other group socially and academically by the time they reach the fourth grade,” said Kyle D. Pruett M.D., a child psychiatrist, published author, and advisor to The Goddard School®. In a study conducted by psychologist Rebecca Maron of the University of North Florida, 1,200 toddlers and preschoolers were followed to measure the long-term academic effects of play-based learning vs. academic-based learning. The results strongly show the play-based learners outperforming the academic group both socially and academically by 4th grade. These findings support the claim that play-based learning increases a child’s ability to both learn abstract concepts and interact with peers. Supported by a growing body of research from Play for Tomorrow, the consortium behind the respected “playful learning” movement, The Goddard School believes in and supports the power of play for learning and has incorporated the concept into their proprietary FLEX™ Learning Program. Playful learning is not a new concept at The Goddard School. It has been at the heart of their curriculum from the beginning, reflected in an approach to learning that presents new skills to children in a playful and engaging way. Research has shown many lifelong benefits of learning through play, including an increased ability to learn from mistakes, develop independent decision making and fine-tuning of children’s physical development and perceptual motor skills. “Young children who learn through play are more capable of making their own decisions, advocating for themselves and using creativity to solve problems as they grow. Play is essential to the development of your child’s brain, triggering trillions of neural connections that form the basis of healthy cognitive function and mastery of your child’s physical world,” says Dr. Pruett. To further support these learning techniques, The Goddard School has launched a system-wide initiative, the Goddard Community Games event, on February 5. During the event, families in schools across the country will have the opportunity to enjoy a “hands-on” playful learning experience with a variety of programs, ranging from Sign Language, Yoga and Nutrition to World Cultures Voyages, Everyday Math and “Rock ‘n’ Tot” pre-dance and creative movement. The focus will be on fun, as parents and their children share in a day of discovery and enrichment. The Goddard School® believes in the power of play for learning. In an effort to spread the word to families across the nation, the educational preschool will sponsor the Goddard Community Games on Saturday, February 5. The event will involve children and their families in a variety of playful learning activities based on the core curriculum and enrichment programs that form an integral part of The Goddard School’s proprietary FLEX™ Learning Program. Playful learning is not a new concept at The Goddard School. It has been at the heart of their curriculum from the beginning and is reflected in an approach to learning that presents new skills to children in a playful and engaging way. Today, supported by a growing body of research from Play for Tomorrow, the consortium behind the respected “playful learning” movement, The Goddard School hopes to encourage families across the nation to recognize and celebrate the power of play for learning in their own children. During the Goddard Community Games event, families will have the opportunity to enjoy a “hands-on” playful learning experience with a variety of programs, ranging from Sign Language, Yoga and Nutrition to World Cultures Voyages, Everyday Math and “Rock ‘n’ Tot” pre-dance and creative movement. The focus will be on fun, as parents and their children share in a day of discovery and enrichment. To learn more about the Goddard Community Games and The Goddard School, parents are encouraged to visit www.goddardschool.com/games.